The weekly Perfect Game small school rundown customarily examines the moving and shaking of the top teams in D-II, NAIA and D-III baseball. After all, it is entire rosters that compete on the diamond to take home titles and not the individual players who have their names etched on national championship trophies. This week nonetheless a spotlight is going to be shown on some of this season’s most prolific individual performers, players who are generating video game-esque numbers which have themselves and their teams at the top of statistical leaderboards and standings. Along with the updated team rankings for each of the three divisions a quartet of players poised for All American immortality are presented. The everyday players are compiling eyebrow raising record numbers while the pitchers are feasting on opposition like they’re at a family bbq. Rankings are based on games through Sunday, April 2. Browning started his college career as a Florida Gator but transferred closer to home after a humbling freshman season. Back home in Lakeland as a member of the perennial power Florida Southern team, Browning has become one of D-II’s most versatile and valuable players. On offense Browning bats in the heart of the Mocs’ order and is hitting .356 with a dozen extra-base hits for a .515 slugging percentage. However Browning’s most important contributions have come as the team’s ace. In nine starts Browning has thrown 53 innings and only allowed 40 hits and 16 earned runs for a 2.72 ERA. He’s only allowed 17 walks while striking out over a batter an inning at 66 for an 11.21 K/9 ratio. While he stands a diminutive 5-foot-7, Browning is a huge reason the Mocs are in the midst of a 17-game winning streak and positioned on the cusp of the top 10. Kasowski is former Houston Cougar who transferred after an injury-riddled season. He has made an immediate impact with his new club and become the dominating ace for the 15th-ranked Buffs. In 48 1/3 innings on the mound this season he has only allowed 22 hits for a .133 opposing batting average. Freakishly he has struck out 96 batters in those appearances for a jaw-dropping 17.88 K/9 IP (58 percent of the batters he’s faced this season have struck out). 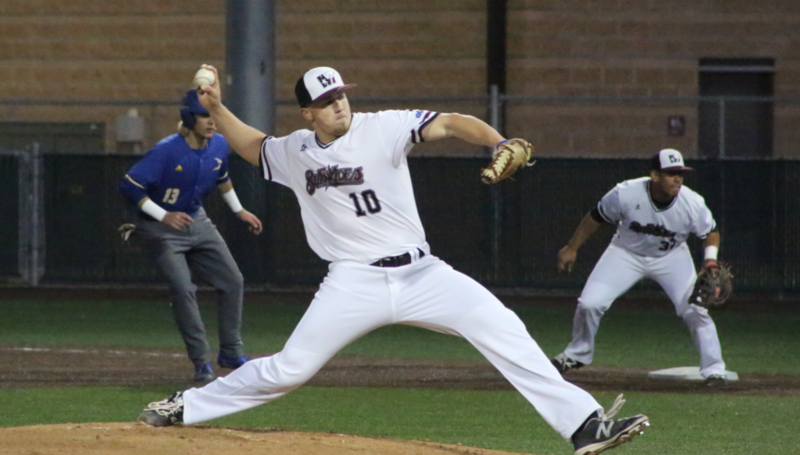 He has compiled double-digit strikeouts in six of eight starts, reaching 16 in just six innings against Lubbock Christian and 17 in 7 1/3 innings against Eastern New Mexico. His 1.68 ERA would be even more minuscule if one bad inning, when he gave up four of his nine earned runs, were removed. He has earned Lone Star Conference Pitcher of the Week honors twice this season, leads NCAA D-II in strikeouts and strikeouts per nine innings and is fourth in hits allowed per nine innings at 4.10. He was also the 2016 Northwoods League Pitcher of the Year after leading the league in strikeouts and had the third lowest ERA. The speedy center fielder has been a one-man wrecking crew for the resurgent Crusaders this season. He is topping the team with a .390 batting average while providing atypical pop from the leadoff spot. His 14 home runs are tied for fifth in the nation and he also has 11 doubles and a triple to amass a third-in-the-country 112 total bases which computes to a lofty .767 slugging percentage. He’s also added 20 stolen bases, which positions him eight in D-II. Last weekend against Mount Olive Beinlich rapped out eight hits in 12 at-bats as Abbey almost swept the highly rated Trojans. Osborne is the best hitter on D-II’s best team and is unequivocally the straw that stirs the Spartans’ offensive drink. He leads the club in each of the triple crown categories (.421, 13, 56) and his .841 slugging percentage puts him among the nation’s top 10 despite playing in one of, if not the, most competitive conference. He’s earned Sunshine State Conference Player of the Week three times already this season, punctuated by his 8-for-15, three home run and nine RBI performance in a series sweep of defending national champion Nova Southeastern. Dropped out: Flagler (24), Henderson State (25). Acosta-Tapia is the cleanup hitter for fourth-ranked Oklahoma Wesleyan. The Laval, Quebec transplant is batting .452 on the season, which ranks third in the Kansas Collegiate Athletic Conference and 12th in the nation. His 16 home runs and .911 slugging percentage both place him second in the NAIA and first in the conference. He is first in the nation in total bases, third in doubles, third in runs and sixth in RBI. His 66 hits combined with 17 walks and eight HBPs have generated a .526 on-base percentage. He has earned KCAC baseball player of the week honors three of nine times this season. Gapp is a 6-foot-6 senior starting pitcher from St. Albert, Alberta. He put up respectable numbers last season, going 7-3 with a 3.80 ERA, but has developed into one of NAIA’s most dominating and dependable hurlers this spring. In his nine starts he has gone the distance in seven of them, throwing shutouts in three. In 69 1/3 innings on the mound he has only allowed 43 hits for a .176 opposing batting average which places him 11th in the NAIA. His 1.04 ERA is fourth in the nation and his eight wins ties him for second overall. Gapp has been named the Mid-South Conference Pitcher of the Week three of eight weeks. It would be difficult to find a player who has had a more impactful performance this season than Bryan’s Bahamas native Chad Burrows. In his 15 appearances this season he’s earned the win or save in 13 of them, going 6-0 with seven saves. He’s only allowed four earned runs in 28 1/3 innings for a 1.27 ERA, has more strikeouts (36) than hits and walks combined (14 and 18 respectively) and has limited opposition to a .186 batting average. For his effort to date, Burrows has already earned Appalachian Athletic Conference Pitcher of the Week after he recorded a win and two saves in 5 1/3 shutout innings against conference rivals Lindsey Wilson and Truett McConnell, the first of what is likely to be many awards bestowed on him this season. Ford has thrown complete games in three of his eight starts for Tennessee Wesleyan with two of them being shutouts. His last outing was his spring pièce de résistance so far as he struck out 18 batters en route to a three hit, no walk shutout. For the season he has thrown 49 2/3 innings and only allowed 35 hits (.201 opposing batting average) and eight walks. He has struck out 67 batters for a clip of over 12 K’s per nine innings. His sensational stats haven’t come easy either. Ford has faced five teams currently in the Top 25 and another who is on the outskirts. Against top-ranked Faulkner he limited the Eagles to four hits and a single run in a complete game win. Dropped out: Lewis-Clark State (22), LSU Shreveport (23), MidAmerica Nazarene (24). Nishioka has unarguably been D-III’s most prolific slugger so far his season. In 102 at-bats the neuroscience major has 22 extra=base hits for a .961 slugging percentage, which tops the nation. Thirteen of those extra base hits were for home runs, which also led the division. His prolific hitting prowess is so extraordinary that if you remove his .480 batting average numbers from the Sagehen stats, the team average drops 20 points. He also provides invaluable defense as the team’s second baseman and has only committed a pair of errors for a .986 fielding percentage. Spaulding starter Jimi Keating earned St. Louis Intercollegiate Athletic Conference Second Team All-Conference honors last season, but this year he’s throwing straight-up First Team All American numbers. In his eight appearances he’s earned the win in seven of the contests with a no decision in the other. While he has amassed 54 innings and four complete games he’s only allowed a measly 33 hits and six walks for an itsy bitsy 0.72 WHIP to pair with his 1.33 ERA. The Hornets usurped the top spot in the D-III rankings from Cortland State this week and a large part of that coup has been the hot hitting of senior Jake Loew. Loew is leading the team with a .417 batting average and has hit eight of the team’s 12 home runs so far this season. He’s twice earned Old Dominion Athletic Conference Player of the Week honors and nearly has the ODAC triple crown (one more hit and he’d have it). The Bears finally clawed their way into the rankings this week after being in the perpetual “others receiving votes” category the first half of the season. Washington’s success has been a team effort with a number of players having elevated their game, but it’s a middle reliever who’s been quietly accumulating some of the most savory numbers. In 20 1/3 innings Jake Mintz has only allowed a handful of hits for a dainty 2.21 hits per nine inning rate, a number which would easily be topping D-III if he had two more outs to quality among the leaders. He’s also only allowed a single earned run for a 0.44 ERA. Last week against Emory, Mintz looked as comfortable on the mound as a dad sporting Crocs and a shirsey as he earned a pair of wins in relief and extended his current hitless innings streak to 10 2/3 frames. Dropped out: The College of New Jersey (22), Texas Lutheran (24).